The resonant CW Speaker is featured in the February 2017 issue of QST. A simple and inexpensive thing to build, and the author said that after listening to CW with the Resonant CW Speaker, a regular speaker will be unacceptable. That hook got me, and I built one. The author is absolutely right! It performs better than an active audio filter! One of the best gadgets I've ever added to my shack. The price tag for parts is minimal, under $15, and an hour to build using a Dremel tool and a soldering iron. I have a loss of hearing and set the CW tone to 600 HZ so to get the speaker to resonate that low I added 2" PVC coupling between the speaker base and the street elbow, and just turned the elbow around. I used two 1/8" mono jacks instead of the author's RCA jacks since my radio takes the 1/8" mono plug for the external speaker output. I recommend you should give it a try, I think you'll love it too! I went out an cut some PVC pipe to start building mine after our QSO. I hope, my build of the "CW speaker" will make a great addition to my 2B. That was the Skytec product of the '70s. I have a few...they work very well! 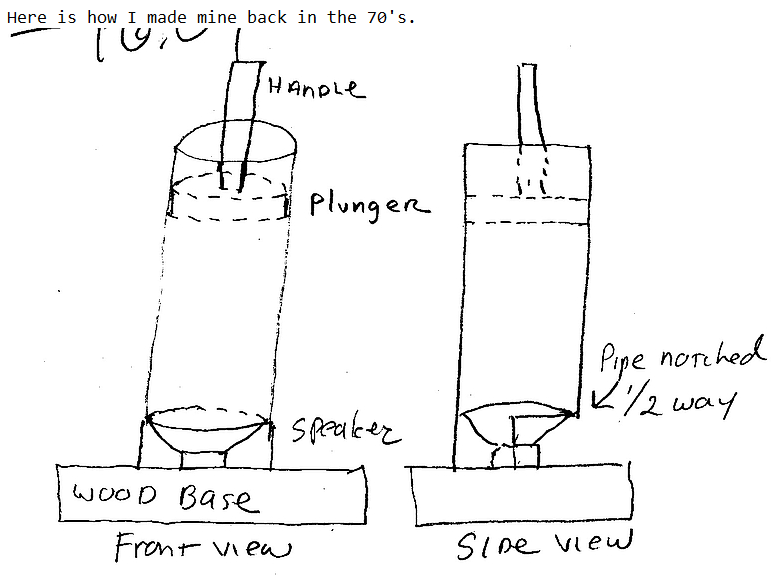 I made something similar, many years ago, with stiff cardboard shipping tubing for 750 Hz notes. Maybe I will make one next, with the PVC pipe, but maybe several inches longer since I have my radios set for 400 HZ notes. A few years ago, I built one of these, based on an article in QST... but wanting to do a quick and dirty version first, as a proof of concept, I built it out of a piece of scrap Foam-core, held together with duct tape... with cotton balls around the back side of the speaker. One thing I did was to get a small sheet of plexiglass (about 6" square) from the local hardware store rather than use CD covers -- it isn't nearly as brittle and is easier to work with. I'm just waiting for the electronics to arrive so that I can finish it -- hopefully before the weekend. Its in the February QST. and read it if you're a member. The magic comes from the cavity. You tune in a note you like then slide the plunger in or out to peak it. Or if an interfering tone tune it to notch the un wanted tone too. Any ideas about making a lower frequency one? I assume the enclosure would need to be proportionately larger; or can you just use use a longer straight section with the 2" pvc elbow? Yup that's all it takes. BUT also look for the "Natural Resonant" frequency of the speaker. Choose one that is closest to your freq of choice and it's even more effective. Every speaker has a natural resonant freq. LIKE A PIPE ORGAN NOTE, THE LONGER PIPE RESONATES ON A LOWER FREQ. Same as a dipole or vertical antenna too, longer for lower freq> It's just physicics. This email message is a notification to let you know that a file has been uploaded to the Files area of the skcc group. Description : Simple spreadsheet to calculate frequency of a tuned speaker when the length and diameter of the tube is known. What is a resonate CW speaker? According to the math... Using the formula F=122.4/(L=(0.3*D)) where F is frequency, L is length of the tube and D is diameter of the tube, as you decrease the length of the horn the resonant frequency will increase. So, if you decrease the length to 5.73" the frequency should be 759 Hz. If you were to have a length of 5.73" and increased the tube diameter to 2.25" you would have 750.5 Hz. I've uploaded a simple spreadsheet for this to the Files Folder.. If you have a top-firing speaker on your rig, simply buying a 4" PVC elbow and setting it on the speaker produces a resonance in the 650-750 Hz range. I call this the "Passive Vocal Clarifier" speaker accessory, or "PVC" for short (grin). If you want to lower the pitch. try setting the elbow on a ring of styrofoam, or just spacers. To raise the pitch by 50-75 Hz, cut off about 1/2 inch from the lip of the elbow. 2. The audio output was extremely low -- too low to be of practical value in my shack. Have others gotten the same results? I'd love to improve the results and would welcome any suggestions if they are out there. Sounds like you don't have enough power goint to the speaker. Did you use headphone output or speaker output to drive it? Headphone output usually has a resistor in siries inside the rig to keep you from blowing out your eardrums when you use efficient headphones ! Measure the AV volts with a tone going to the speaker, should get good, loud volume with anything over 1 V AC across the speaker. . I had the same results as you. Where on your radio did you connect the audio input (Audio out of your radio) side of the speaker? I have a PROIII and first used the front "phone jack" for my audio input to the resonate speaker. I also had the very low audio output with my radio volume control turned all the way up. Then, I took another look at the ICOM PROIII manual. The phone jack on the front of that radio is rated at 5 milliwatts output max. which makes sense so you do not hurt your ears. The speaker connection on the on the back of the radio has a full 2 watts of audio output. Thanks to suggestions here, my problem is solved. I had the speaker connected to the audio jack on the rear of my Flex 6300 and the audio was too low. I tried the audio jack on the front of the Flex and the audio was excellent! I found that by adding an additional inch of pipe, the response was even better..
Again, thanks to all who tried to help. As shown in the photo in QST, the speaker has a resonant frequency of about 900 hz. By adding an extension, you can vary the resonant frequency. 2.0 inch extension resonates at about 600 hz. Personally, I find the 650 hz to be the most comfortable. I've really enjoyed my CALF CW audio filter. You can choose the width all the way down to 80hz. And I've used 80hz but mostly use 500hz and 200hz. They sound beautiful and much better than an electronic filter because they do not ring - Very mellow sounding. Also they allow you to use fast AGC and QSK without all the usual unwanted noises. where the even numbered harmonics are missing in such instruments as flute and clarinet. How to find the frequency at which an object vibrates the most. Water's oxygen hydrogen bonds can be broken in many ways resulting in high energy outputs that are stored in water. Since water contains an enormous amount of energy, the potentials are endless. This video demonstrates a single method of water bond breaking using radio frequency. Novice Rig Roundup FINALLY made it into QST's Contest Corral after 3 years of trying! See Page 97 of February 2017 QST. We are also on Page 154 and 3/4 of the way down the right hand column! NRR is GETTING ON THE MAP!! Palm single lever paddle as cootie key. Has anyone tried the Palm single lever paddle which can be switched to cootie mode? The Palm paddle - and all paddles can be used as sideswipers. People say the Palm paddles are way too light. 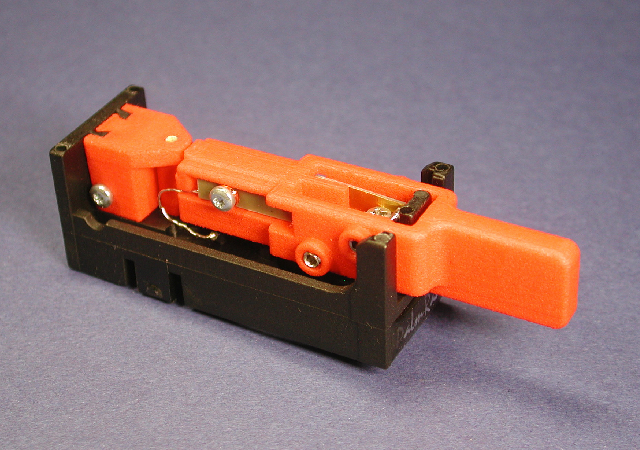 as they have paddle fingerpieces - those are the ones that are flat, that you can use to convert a single or dual lever Vibroplex to a sideswiper. where I learned a lot more today !! Thanks fellows, have a nice weekend, BCNU.